[M]ore than 30 individuals have been accused of being Piltdown hoaxers. Charles Dawson, the archaeological enthusiast who found the first pieces, was almost certainly involved. But many scientists still suspect he had the backing of experts who were the true guilty parties. Candidates include Arthur Conan Doyle, who played golf at Piltdown and had a grievance against scientists because of his spiritual beliefs; the Jesuit philosopher, palaeontologist and alleged practical joker Pierre Teilhard de Chardin, who lived in Sussex at the time and who actually helped Dawson dig at Piltdown; Arthur Smith Woodward, the Natural History Museum scientist, who accepted Dawson's finds as genuine and argued they belonged to a new species of early human; the anatomist Arthur Keith, who also passionately endorsed the discovery; and Martin Hinton, another museum scientist, whose initials were found, in the mid-70s, 10 years after his death, on an old canvas travelling trunk, hidden in a museum loft, that contained mammal teeth and bones stained and carved in the manner of the Piltdown fossils. 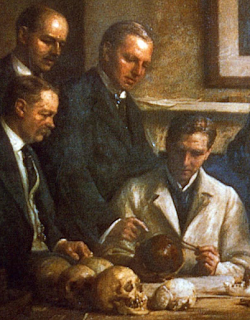 When it comes to suspects, the Piltdown Hoax makes Midsomer Murders look restrained.